After seven long years I went to Gorakhpur in Uttar Pradesh, a state in Northern India, along with my parents and some of my relatives from Kolkata. It is the city, located along the banks of Rapti river and is near India-Nepal border, wherein two of my uncles and one of my aunts live. It is the birthplace of Gita press - India's oldest and largest printing press, and it has the longest railway platform in the world. Altogether we were a clan of twenty enjoying a family reunion there, at my uncle's residence. 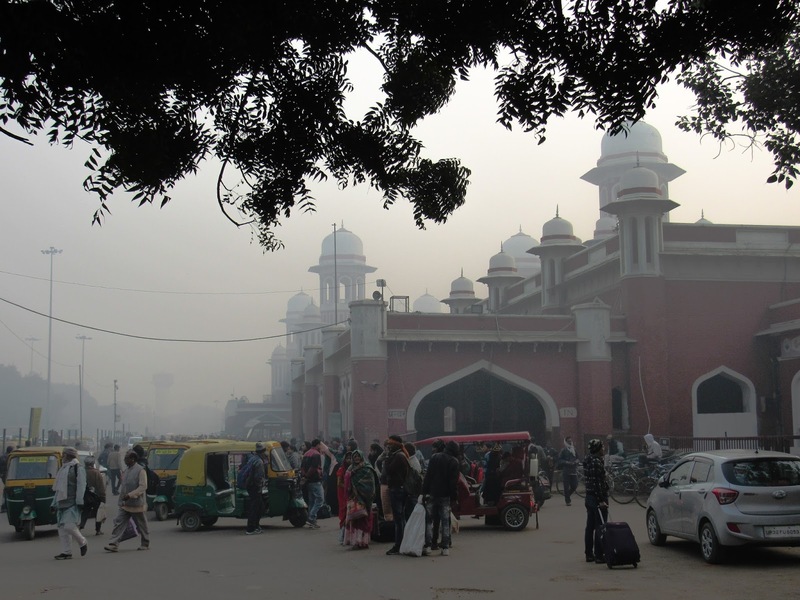 Since a historically rich city was not too far from Gorakhpur, I had already planned for a jaunt to Lucknow and hurriedly bought the train tickets en route to Gorakhpur. We reached Lucknow in the morning of December, 28, 2017. It is the capital of Uttar Pradesh and was historically known as Awadh region. It wasn't a difficult city to explore. 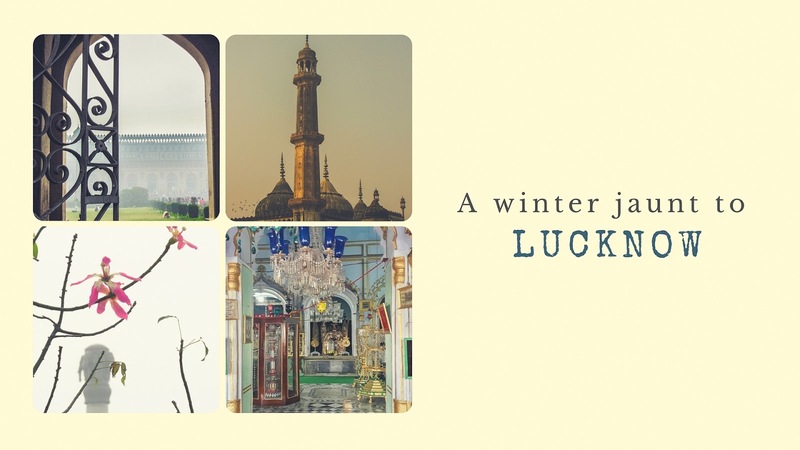 The main attractions are Bara Imambara, Chota Imambara and Roomi Darwaza. Like Esplanade in Kolkata, Hazratganj in Lucknow is a cradle to plenty of restaurants, shopping complexes, theaters and offices. We had Lucknowi chai and bread malai sandwich for breakfast. The memory of the appetizing aroma of the chai and the taste of the moist sandwich will stay for a long time to come. Lucknow is located along the banks of Gomti river. 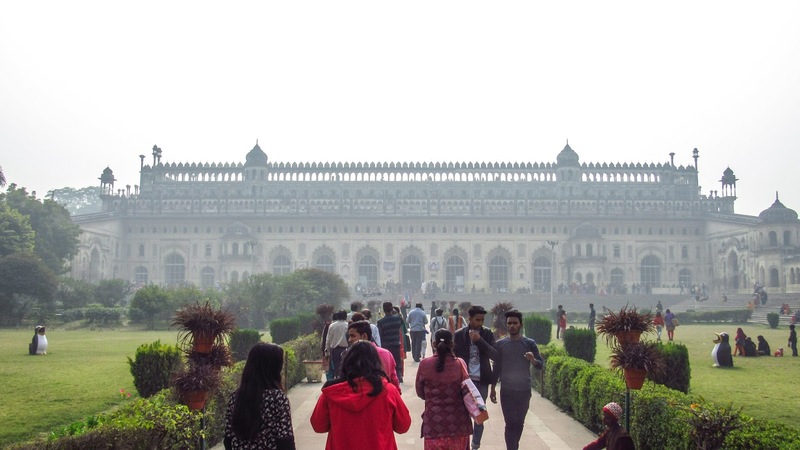 It has a rich past - Lucknow is synonymous to the City of Nawabs because it was once the home to the Nawabs during the Mughal Era when Mughal emperors appointed Nawabs to administer the province, which was earlier controlled by Delhi Sultanate. But when the British came to India, they conquered the Nawabs and ruled the city. At a time when cacophonous music rules speakers throughout India, I was happy to listen to classical music at the Lucknow railway station. Hindustani classical music which originated in the Northern parts of India still has a good influence over there. Lucknow is famous for poetry and shayari too. Traditional embroidery style, Chikan or Chikankari, has its roots in Lucknow. 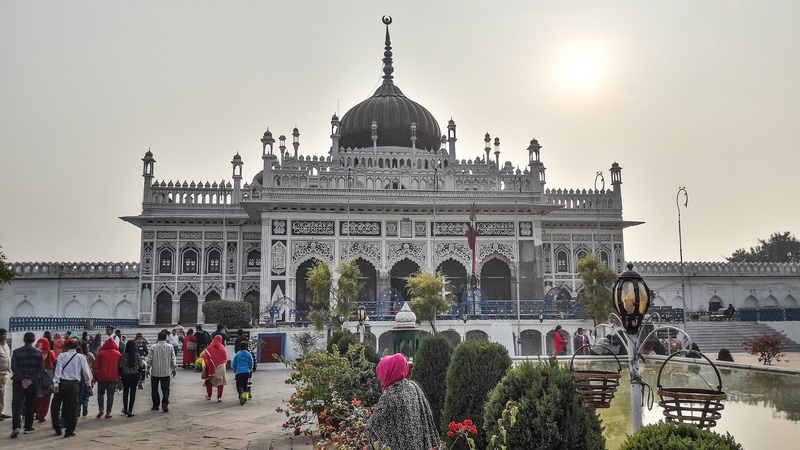 Mughal Raj played a great role in the cultural and architectural development of the city and hence is also known as - the City of Tehzeeb (Urdu word Tehzeeb means culture). I have heard that narrow alleys in Lucknow leading to food stalls serve tastier kebabs than glossy restaurants. Variety of kebab preparations, Lucknowi biriyani and the delectable-paan make Lucknow a foodie's paradise. The native cuisine is known as Awadhi cuisine which has been mainly influenced by the Mughals. The 107-acres Ambedkar Memorial Park was constructed by Mayawati, Former CM of UP. The cost of construction is estimated at ₹7000 crores. Ironically, the greenness in the park seems like just a drop in the ocean when compared to the substantial number of stone sculptures of elephant that adorn the park. 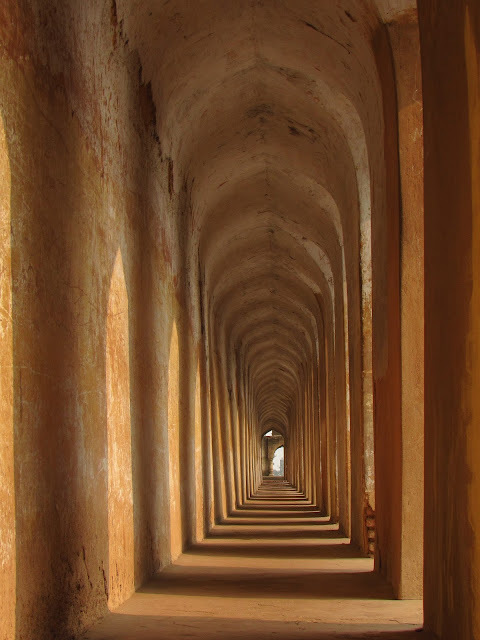 When I was a kid my father told me about the intricate network of tunnels situated on top of the Bara Imambara in which one can easily get lost and since then the labyrinth or Bhool Bhulaiya had flabbergasted and intrigued me. It has a single entrance/exit and has over 480 doorways that can bewilder a person after a few failed attempts to exit the labyrinth. Our guide showed us a sealed tunnel leading to Delhi, Agra and Faizabad. We ended our journey sipping roadside tea and saw Vidhan Sabha Bhawan on the way towards the station in the evening. And, the next morning we were back in Gorakhpur; bitter cold winds drilling my bones once again. It was much warmer in Lucknow than in Gorakhpur. See more photographs I took in Lucknow, here. Great post and pictures. Carry on. very well written!! quite informative.. keep up your writing so that we get to know more.. Nature has so much to offer. And you see them fine through your lens :) . Keep up the good work. This write up has so much warmth in it, that it engulfed my shivering existence just like a suave stroke of morning glory. A sincere memoir of a nonchalant young mind indeed. Don't let your fingertips to get weary of weaving words. There's many greats yet to come. Thanks, Kushal Da for those benign words. I read your Lucknow post. You make it seem like its a very beautiful place to go, contradictory to what everyone else would think. The elements in your writing reflect how much time and effort you put into it. Its absolutely beautiful. I loved reading it, and you pretty much gave a tourist's guide to traveling there, will definitely look back at it if I am ever visiting there. Keep up the amazing work, and let me know about any new blogs. Regards, Sohini.